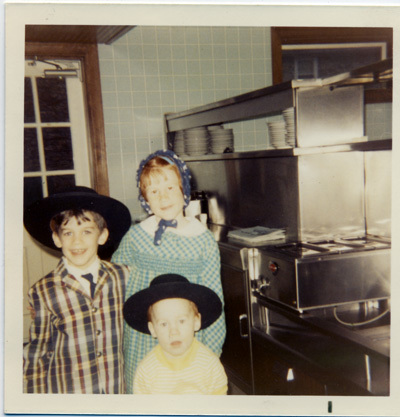 My sister, Erin, brother, Brian, and I (in snappy jacket and tie) pose in Amish hats in front of the grill inside The Guernsey Cow, Easter morning 1970. Every Easter after church at nearby Sts. Philip & James we would gather at The Cow for breakfast. An Easter basket hunt out behind The Cow among the large trees and bushes with Willie‘s help was always the main event. The other benefit to being grandchildren of the owners was searching for loose change that fell on floor beneath the ice cream counter. 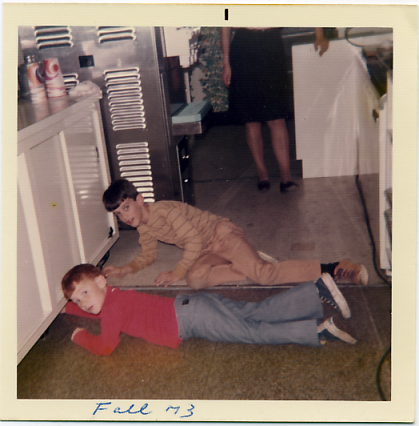 In the photo below from 1973, my brother, Brian, and I are caught in the act. Kids search for change under the ice cream counter, 1973. Thanks to my sister for borrowing these photos from our grandmother, Gladys’, collection! If you have photos inside or outside of The Guernsey Cow, email me copies to post on the site — we’d love to see them! I grew up in Exton, Pa on Shoen road not far from the Cow. I remember Willie riding through my neighborhood., He would always say hello in his special way. I was always amazed that he remembered my name even when I was just a little kid. I don’t think I ever saw Willie without a gigantic smile on his face. I remember one time he let try to hold his bike up when I was little kid. It was too heavy for me with all of the horns and mud flaps and mirrors. I remember seeing him at the Farmers Market and I’d always see his parked in the Drive In. My family would got to the Cow every Sunday after church. I think I ordered the same thing every week for 15 years or so. It was cube steak sandwich with fries and a black & white shake and it was awesome. I can still my brothers lips stained black by the blue moon ice or the licorice. It was a great place in a great time. It was my brother Brian’s first job working at the cow. Do you remember the place across the street where the big cow sign stood. It was called the Vittle House run by three brothers. They sold a sandwich called a beer sandwich that was incredible. I could die for one of those beer sandwiches now. Thank for the Memories. I live in Memphis, Tn now and it was a great trip down memory lane. Thanks for the note Tom! Does anyone else out there remember the Vittle House and what beer sandwiches are made of?